The following words of remembrance were delivered by Sister Barbara Schiavoni, GNSH at the Funeral Mass for Sr. St. Catherine on January 5, 2019. Thus began the love story that was to be woven over the next 80 years. And that love woven between Mary Theresa and her God grew and flourished, and enriched countless lives. Sister St. Catherine was a lifelong educator; her career spanned 51 years as teacher, principal and librarian. Sister St. Catherine especially loved teaching English and Geography. Once, anxious about teaching an all-male class, she told Sr. Donalda that she “hated boys.” She confessed, however, that by the end of the year, she loved them and she laughed at the memory. Catherine was certainly a treasure. All I have to do is think of her and I feel happy and blessed. She respected everyone and was concerned about others’ well-being. A peaceful person, never spoke ill of others. With difficult people, she tried hard to find common ground so she could relate with them. She lived in the moment, found the gift of the moment. To her, people were gifts. She grew old gently and gracefully. Sister St. Catherine was true to her words throughout her life, taking personal prayer time in the Chapel each day and attending Daily Mass. Here at Magnificat, Mass is at 6:45 am, at which time she was up and dressed, ready for her day. Prayer was the center of her life. She made her home in God, and God’s love shone through her. Sister St. Catherine lived a spirituality that embodies Christ for others, a true daughter of St. Marguerite D’Youville. You may know of St. Catherine’s love of the deer on the hill at Yardley. For most of her years at the Motherhouse, she had a room overlooking the hill because she loved to watch the deer. When she needed to move closer to the elevator, she graciously gave up her deer. She understood, but it was a letting go. I think we can safely conjecture that the deer, too, were a part of her spiritual life. Sister St. Catherine accepted the challenge of relocation, at age 95, with grace and dignity. She and the five other Grey Nuns of the Sacred Heart who settled at Magnificat were warmly welcomed and soon found home and community, thanks to the graciousness of the Redeemer Sisters, their Associates and Staff members. St. Catherine appreciated the prayerfulness of the house and the social aspects as well, enjoying meals and activities. She quickly made friends, was content with her surroundings, and was very grateful for her home here. She was a quiet soul but she knew what was going on. She enjoyed Bingo, the TV news after lunch, and listening to Agnes play the piano. She spoke of the chickens, goats and cats at the little farm outside her window with a sense of wonder. I’ve been told that Sister enjoyed the baby lamb that Sr. Anna Dura, CSR brought up, and also the miniature pony that once paid a visit. Sister St. Catherine remained active in Grey Nun life. She celebrated her 80th Jubilee in 2017, had the most guests of any of the sisters celebrating – most of you (family) were there – and was the last to leave. She was interested in all that was going on in the congregation. When the new Leadership group was installed last July, she asked about the celebration and said she was thinking of the community and praying for our new leaders. Sister St. Catherine taught me that you are never too old to make a new friend. She welcomed me into her room – and her heart – when I arrived in Philly six months ago. I will treasure our conversations. During those final weeks, St. Catherine waited patiently for the Lord, surrounded by her loving family, her Grey Nun Sisters, Redeemer Sisters, Staff members and friends. Your presence gave her peace and comfort and eased her journey home. I must thank the staff here at Magnificat: You were outstanding in your care and affection for St. Catherine and we are most grateful. Thank you, Sister St. Catherine for sharing your love story with each of us. With gratitude to sisters Cathy Bleiler, Ceil Cosgrove and Eileen White; and to Eileen Dickerson and Marilyn Balogh Taylor for assistance with this reflection. Click here for the poem, Life’s Weaving read at Sister’s funeral. 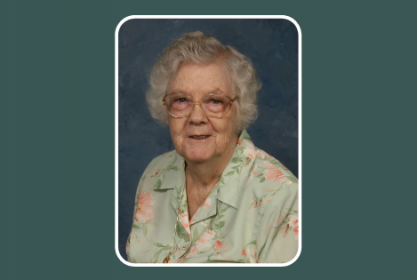 Sister St. Catherine Curley, GNSH, died December 28, 2018 in the 81st year of her religious life. This lifelong educator served in Pennsylvania for fifteen years. She taught at St. Canicus, Mahanoy City, Our Lady of the Assumption, Strafford and St. Norbert’s, Paoli. She was principal at Mother of Divine Providence in King of Prussia and at Sts. Peter and Paul in Lehighton. She also served in Jackson Heights, NY for thirty-five years. In 1992 ill health led to her retirement to the Motherhouse in Yardley, PA. After recovery, and unable to leave behind her love for the school community, she was welcomed as an office assistant and later a volunteer at Grey Nun Academy for more than 10 years. Sister St. Catherine received her BS in Elementary Education from D’Youville College, Buffalo, NY and an MS in Elementary Education from Queens College, NY. Mary Theresa Curley was born January 1, 1921 in Mahanoy City, PA and entered the Grey Nuns of the Sacred Heart in 1937. She is predeceased by her parents, five sisters and one brother. In addition to her religious family she is survived by several nieces and nephews. A viewing will be held at 10:00 a.m. on Saturday, January 5, 2019 in the Redeemer Sisters Chapel, 521 Moredon Road, Huntingdon Valley, PA; her funeral mass will follow at 10:30 a.m. Burial in Resurrection Cemetery, Bensalem, PA. Memorial donations in Sister’s memory may be made online to the Grey Nuns of the Sacred Heart, or by mail at the following address:14500 Bustleton Avenue, Philadelphia, PA 19116. I was in Sister St. Catherine’s class for two years at St. Joan of Arc in the 60s. I remember her as both soft spoken and tough. I also remember her kindness when my mother died in 1964. May she rest in eternal peace. Sister St. Catherine was my English teacher for three years at OLF in Jackson Heights. Sh was an amazing teacher. I am forever grateful to her for all she taught me concerning grammar, literature and respect for self and others. God bless you Sister. I’m sure you now know that I finally read War and Peace as well as Anna Karenina! War and Peace was my favorite. Rest in peace in the loving arms of Jesus, Sr. Catherine. She was my 7th grade teacher at Our Lady if Fatima School, Jackson Heights, N.Y.. She was the best teacher that I had at OLF. She taught well and took a personal interest in her student’s success. She was caring, firm but compassionate with her students. Also in charge of AAA Patrol Boys at the time. Sister taught the SJA Class of 1956 in 6th grade. After a class reunion in 2004, the class adopted Sister Catherine , Sister Mary Angela, and Sister Roseann and kept in touch with them especially at Christmas time when we delivered presents to each of them. Sr Mary passed 1/2017, Sr. Roseanne 2/2018. Sr. Catherine was the last of our teachers still alive. She was a wonderful person and was strong of mind and spirit till the end. God Bless Her. Sister St. Catherine was my principal at MDP in the 1980s. She was 97 years old, joined the sisterhood when she was 16, and worked in schools for 60 years. She was blessed with a long life, ran a good school, and had in her heart the concern of her students. God bless her. Sister Catherine was my first and fifth grade teacher at St. Canicus School in Mahanoy City. Also, her family lived only a block away from my home. I remember her well and I am absolutely sure she is in heaven with the God she worshiped and loved. God bless her for her dedication to children! I am so happy that I was one of the many children she taught! Thank you sister Saint Catherine for having the passion for promoting good English. My life has been better because of it. Rest in the arms of Jesus! I have thought of you often throughout my life, Sister St. Catherine, and embraced the joy of life you shared with us. Thank you for being such an inspiration and spiritual guide. I shall keep you in my prayers always. RIP. She was never forgotten by her students from Our Lady of Fatima in Jackson Heights, NY from 44 years ago. Her name still comes up when we find ourselves in reverie. “A linking verb never takes a direct object.” Rest in Peace, Sister St. Catherine.